I'm joining in with Seven Cherubs for the fourth week of Cherish Your Cherubs. This week's theme is praising your cherubs, for previous week check out these link; one, two, three. This week we were asked to be mindful of letting our children know how much we appreciate them through praise. I have to admit, I didn't do very well, certainly not as well as I would like. I could spend time lamenting about being stressed and depressed, but really those are just excuses. In this post I want to focus on an area in which each boy has really excellent himself - positively - this week. Bryn started school this year and that brought a lot more personal responsibility into his life. At school he answers to different authorities than at home and he has to be mindful of a different set of rules. He has taken all of this in his stride. However, he has really struggled with one area. No matter how much we remind him, and question him at the end of the day. No matter the consequences or rewards, Bryn cannot seem to bring all his school bag items home each day. We've done several jacket and hat searches, one or two take home folder searches, but most challenging has been the almost daily forgotten lunchbox or snack container from his cooler bag. A couple of these items have been broken in rough play (throwing them at force from the top balcony of the his building to "see how they bounce"), but we manage to impress on him how thoughtless such vandalism of his personal item was. Mostly though, and especially with snack boxes (tupperware cups with lids), they simply disappear, never to be seen again. I don't even want to tally up how much tupperware he's left behind at school this year. Suffice it to say, my collection is beginning to look sparse and that is saying something! He's gone without snack on a couple of occasions to try and impress upon him how serious this situation is (we're not allowed to send food to school in none recyclable packaging). This last week, I'm pleased to say that EVERY DAY Bryn remembered to bring home his lunch box, snack box and drink bottle. For this he has received a lot of praise! Ari is turning three at the end of next month. He is growing and developing more understanding and self-restraint every day. Only three months ago, I couldn't let him out of the pram for fear he would run straight out onto the nearest road. He point blank refused to hold my hand when out walking. He would scream and yank on my arm like a wild beast and generally make attempting to walk with him anywhere a misery. I briefly contemplated just making him sit in the pram until he was four and a half as I had done with his big brother Lukas - who also resisted any sort of restrictions on his personal boundaries when not constrained by the pram, I gave up on this idea though because Ari has a very loud voice when he gets frustrated. I decided to attempt reason. Reason had worked very well with Bryn, and while Ari is a different personality for the most part, he has shown signs of responding positively to reason. So, I implemented a "hand or pram" policy. He was welcome to get out of the pram as long as he held my hand or held the pram. He wasn't able do it with the other three boys around, but I found on his own, he was much more focused. So, I gave him a few opportunities while the boys were at school. We went to the shopping centre a few times. We also walked home from school in the mornings with him walking beside the pram, and the same at pick up with him walking up to the school next to the pram, and home again next to the pram unless he started mucking around because the boys were there - then I promptly strapped him back into the pram. This week he's shown me he can walk holding mine or one of the boys' hands without yanking at our arms, or dropping like a dead weight. He offers to hold hands with us now rather than going in the pram. I can take him to the shopping centre and even if I can't hold his hand because my arms are full with shopping, he now stays close to me. This is a brilliant development and I'm looking forward to selling the pram soon! Luey has been helping out doing the dishes. He's been doing the dishes for a while now - a few months. 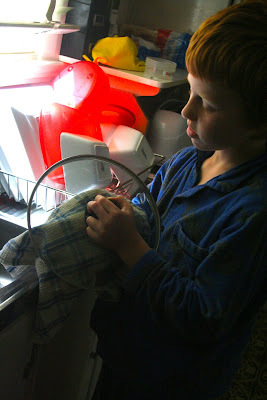 He also cooks dinner sometimes and does other tasks around the house, but the really positive change I've noticed lately is that he is now doing these things without whining or trying to get out of doing them. When Luey was little he hated cleaning up. It was so hard to get him to help put his toys away. He would drag his feet. He would tell us it was too hard. He would claim to be tired or to have a headache or that it wasn't his mess (there is a policy in this house that it doesn't matter who's mess it is, we all pitch in and help). Many, many times we would need to sit with him and tell him every. single. item to pick up and where to put it. Recently, all the resistance has disappeared. Now if he is asked to do something, he just does it. He doesn't whine or moan or take forever. He gets on with it, gets it done, and does it well! We really appreciate this change in attitude, it makes it so much easier for everyone when everyone just gets on with the job of helping. Erik has always been very helpful when it came to household jobs. He is very willing to please in that way. Many years ago, the Grumpy Old Man (in an attempt to positively engage Luey, who was going through a particularly sucky period of "the world and everyone in it hates me" after Bryn's birth) took Luey under his wing and started teaching him to cook. To begin with, Erik wasn't interested and the GOM didn't make any attempt to pique his interest because two people in the kitchen was enough to concentrate on. Over time though, as Luey began to cook more and more meals almost completely on his own, Erik began to show an interest as well. It took a little petitioning on my part to get the GOM to apprentice Erik because he was already very comfortable with Luey's learning style and Erik is quite a different kettle of fish, but eventually the GOM saw that it would be beneficial for Erik to have some one-on-one time with Dad in the kitchen and so the apprenticeship of Erik began. That was a few months ago. This week Erik made the. most. delicious. Chilli Con Carne all on his own. He set the table and everything. It was just lovely! He was also so proud of himself, which was great to see. I wish I'd had the presence of mind to photograph it... Next time! Last week was a tough week. There were many stressors and I wasn't as good at praising the boys as I had hoped to be, but doing this exercise made me think (long and hard) about the things I've really appreciated about my four this week, and I've needed to do that to reconnect with what I love about being a mum to these four boys. So, thank you Naomi for affording me this opportunity this week! I have also just been reminded that I really want to participate in the great "me and YOU Monday" link up over at The Mother Experiment. The Cherish your cherubs project has brought into sharp focus for me how I really want to appreciate my children more - maybe that will cause me to worry and stress about them a little less - because I feel that a lot of parenting energy going into being a police woman for their offending behaviour, rather than the cheer leader for this wonderful behaviours. So, for me and YOU Monday, I want to work on being more openly appreciative of them, to them. Please check out me and YOU Monday over at The Mother Experiment if you have a personal goal you want support working on as well (and of course, you have the added gift of being able to support other reaching their goals as well)! Wow what a week of achievements very worthy of lots of praise. Sounds like you are going to have a little army of very handy helpers in no time! I found it hard to praise my kids enough too, I'm sure I'm still more negative than positive but it is a work in progress. At least we're all more aware of this now and we can change for the better! It sounds like you're doing a great job. They sound like wonderful kids. And how wonderful to have little cooks! Oh, I replied to these comments last night - but my reply doesn't seem to have gone through! Thanks so much everyone for your lovely comments! The boys really are very good at helping around the house. I think we probably have very high expectations about this, too. I guess I just want my boys to feel part of a community - not just one they need, but one that needs them, too! I do worry though that I need to show them I appreciate them not only for what they do but for who they are... Always something to work on, hey? I can see how these exercises have helped so many people really consciously think about their children. It's so easy to get caught up in the routine of the day and not take special time out. I do it often. It takes effort to be consciously there for our kids and doing the exercises helps focus that. Your boys sounds so wonderful. Wow Erik! Chilli Con Carne - yummy. Great post.